P1230. ARTHUR de GREEF: Grieg Recital - recorded 1929 & 1929; w.Landon Ronald Cond. London S.O. : Concerto in a (Grieg), recorded 18 Jan., 1927; Concerto #2 in A (Liszt), recorded 1930. (Canada) St Laurent Studio YSL 78-365. Transfers by Yves St Laurent. 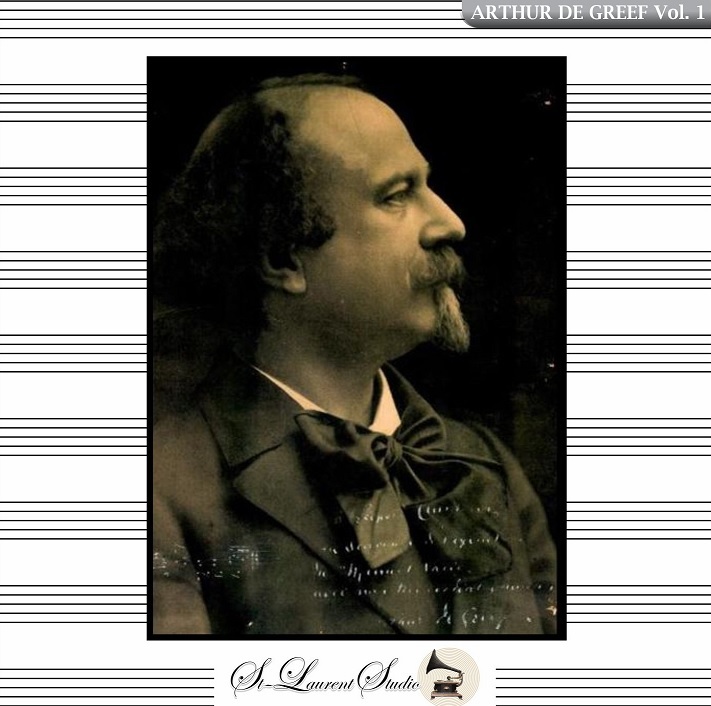 “Arthur de Greef studied piano at the Brussels Conservatory with Louis Brassin, winning first prize in 1879. 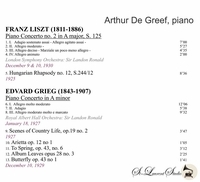 He also studied composition with François Auguste Gevaert, and it may have been one of these teachers who suggested that the young de Greef continue his studies in Weimar with Franz Liszt. It is not absolutely certain how long he studied with Liszt: an authority, Donald Manildi, states that he was fifteen when they met and that he studied for ‘about two years’ which implies the years 1877–1879; however, he may not have begun tuition until 1879. 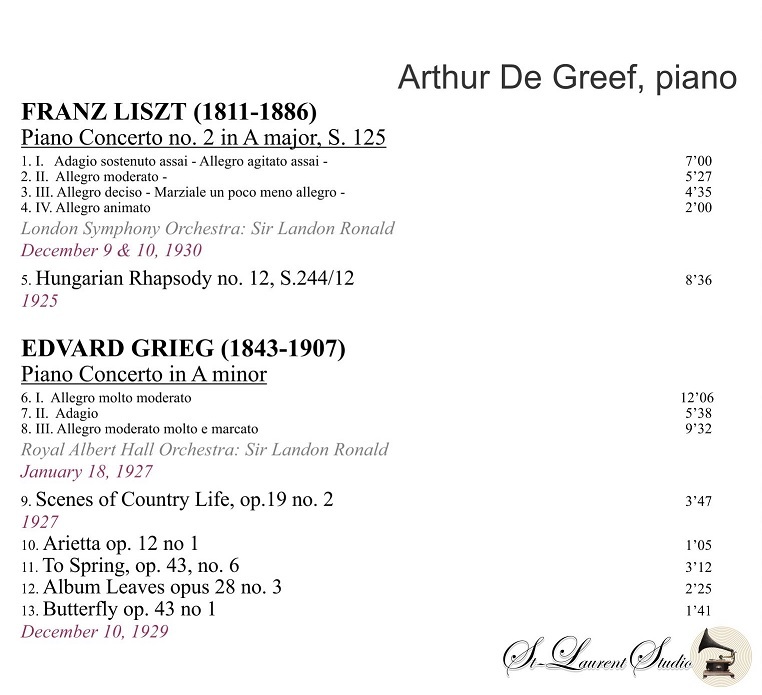 Following his period of study with Liszt, de Greef spent some time in Paris where he received tuition from Saint-Saëns. In 1889 Grieg visited Belgium and conducted performances of his Piano Concerto in a minor with de Greef as soloist. The performances were a great success, and Grieg asked de Greef to play the concerto in Paris the following year. The two musicians became friends, a relationship that lasted until the composer’s death in 1907. Grieg wrote in a letter to violinist Ole Bull, ‘de Greef is the best interpreter of my music I have met with. It is surprising how he understands my meaning. Whether I roam over the mountains or through the valleys, whether I am refined or vigorous, he follows me with a wonderful instinct. I feel happy and honoured by his sympathy for my art. He is a real Master; that I see more and more, just one of those whom you may look for with a lantern all around the musical world’. In 1885 de Greef returned to Brussels to take up a post as teacher of piano at the Conservatory, and in December 1887 was created Professeur Supérior de Piano by royal command. He first visited London in 1890, and in 1892 took the rare step of playing a piano concerto by Mozart in a performance conducted by Hans Richter. George Bernard Shaw who reviewed the concert stated, ‘I have to congratulate M. de Greef on having come triumphantly through the ordeal of taking Mozart’s own place at the pianoforte in the c minor Concerto’. In the same year de Greef gave a series of recitals in Paris devoted to the history of piano music, and for the next forty years he combined a teaching career at the Conservatory with that of performing. He also composed, leaving amongst his works a symphony, three symphonic poems and two piano concerti. de Greef’s style is somewhat like that of Emil von Sauer. His playing is clear and lucid, free from indulgence and rhetoric. An interesting feature of some of his recordings is his alteration of the text. Most important are the recordings of works by Grieg, Saint-Saëns and Liszt where it can be assumed that the alterations and additions were sanctioned by the composers themselves. Grieg evidently approved, as Percy Grainger, who also studied the work with its composer, makes changes to the text in his performances of Grieg’s Piano Concerto, and later published an edition for Schirmer detailing these changes. de Greef recorded for HMV from 1918, and because he made many discs in the early 1920s by the acoustic process, he made them again after 1925 when this process was superseded by electrical recording. His most important recording is that of the Grieg Piano Concerto, which he recorded acoustically in an abridged version in 1921, and electrically in 1927. The same thing happened with Liszt’s Hungarian Fantasy, and also Saint-Saëns’ Piano Concerto #2 in g minor which he recorded in 1921 and 1928.